UPDATED: Thu., April 19, 2018, 11:05 p.m. Updates to include all of Thursday’s games. 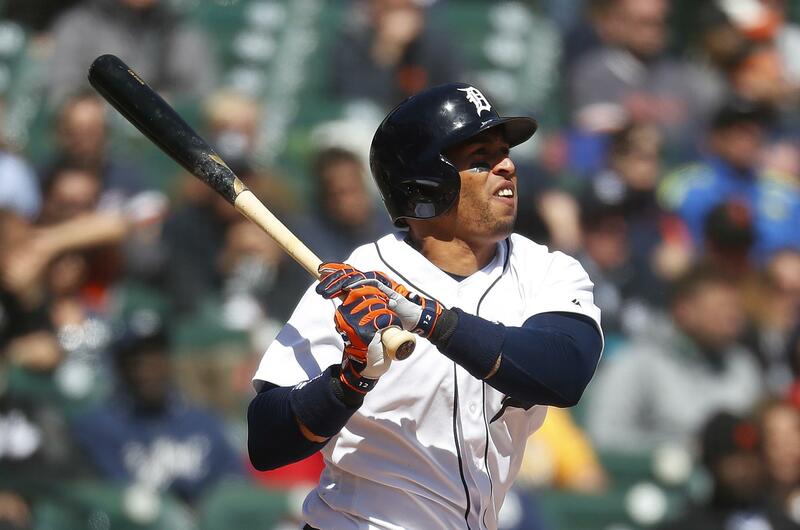 Leonys Martin hit his first big league grand slam, and Jeimer Candelario had four hits and three RBIs as the Detroit Tigers defeated the Baltimore Orioles 13-8 on Thursday in Detroit to complete a three-game sweep. Baltimore has lost six in a row. Jordan Zimmermann (1-0) gave up four runs and seven hits in 5 1/3 innings, allowing two home runs to Manny Machado and one to Chris Davis. Alex Cobb (0-2) made his second start after signing late in spring training and his ERA rose to 15.43. He allowed seven runs – five earned – and 10 hits in 3 1/3 innings. Red Sox 8, Angels 2: Mookie Betts hit his second leadoff homer in three games, Andrew Benintendi homered and drove in three runs and Boston completed a dominant sweep of A.L. West-leading Los Angeles, defeating the Angels in Anaheim, California. J.D. Martinez and Rafael Devers also drove in runs during the seventh consecutive victory by the major league-leading Red Sox, who have won 16 of 17 since losing on opening day. Eduardo Rodriguez (2-0) pitched six innings of three-hit ball as Boston extended the best start in the 118-year-old franchise’s history. Astros 9, Mariners 2: Charlie Morton pitched seven innings of three-hit ball, Jose Altuve hit a three-run double and Houston defeated the Mariners in Seattle. Morton (3-0) retired 15 straight at one stretch and didn’t allow a runner to reach second base. Marco Gonzales (1-2) allowed three runs – all unearned because of a throwing error by third baseman Kyle Seager – and four hits in 4 2/3 innings. Brewers 12, Marlins 3: Lorenzo Cain homered, doubled twice and scored four times, and pinch-hitter Ryan Braun launched a three-run homer in Milwaukee’s win over visiting Miami. The Brewers erased a 3-2 deficit with three runs in the fifth inning and added seven in the sixth. Slumping Lewis Brinson, acquired from Milwaukee in the offseason trade for Christian Yelich, celebrated his return to Miller Park with his first two homers of the season for Miami. Chase Anderson (2-1) allowed three runs and five hits in 5 1/3 innings for the win. Dillon Peters (2-2) gave up four runs, three hits, five walks and a pair of wilc pitches in 4 2/3 innings. Diamondbacks 3, Giants 1: Zack Greinke (2-1) allowed one run and three hits in seven innings, giving up a solo homer to Brandon Belt, and Arizona won its sixth straight series, defeating San Francisco in Phoenix. Brad Boxberger got Belt to pop out with two on in the ninth inning for his fifth straight save to open the season, a night after allowing the go-ahead homer to Belt in the 10th. A.J. Pollock hit a solo homer off Ty Blach (1-3) and Ketel Marte also had a solo shot to help the Diamondbacks take two of three from the Giants. Arizona had never opened a season with more than two straight series wins. Cubs 8, Cardinals 5: Jon Lester (2-0) was dominant through six innings of two-hit ball in his 100th start with the Cubs, and Jason Heyward hit a two-run homer to lead Chicago past visiting St. Louis. Ten of Chicago’s first 16 batters reached against Luke Weaver (2-1), who allowed six runs and nine hits in four innings. Yankees 4, Blue Jays 3: Aaron Judge hit his fifth home run for a 4-2 lead in the seventh inning and David Robertson pitched out of an eighth-inning jam in New York’s win over visiting Toronto. CC Sabathia allowed two unearned runs over 4 1/3 innings in his first start since straining his right hip on April 6. Chad Green (1-0) retired five straight batters, Dellin Betances pitched a perfect seventh and Robertson handed the lead to Aroldis Chapman, who struck out the side on 12 pitches for his third save, twice topping 100 mph. Aaron Sanchez (1-2) held New York to three runs and seven hits over six innings. Giancarlo Stanton had an infield single to snap an 0-for-15 skid. He was 1 for 3 with a walk and is 4 for 38 with 20 strikeouts at Yankee Stadium this season. Phillies 7, Pirates 0: Jake Arrieta (2-0) struck out 10 and tossed one-hit ball over seven innings. Yacksel Rios allowed a hit in the eighth and Victor Arano finished the two-hitter with a perfect ninth, leading Philadelphia’s win over visiting Pittsburgh. Rhys Hoskins homered and Cesar Hernandez had a three-run single for the Phillies. Pittsburgh’s Jameson Taillon (2-1) allowed five runs and four hits in 1 1/3 innings. Braves 12, Mets 4: Preston Tucker drove in a career-high five runs for Atlanta, and Matt Wisler (1-0) allowed one run on two hits in seven innings after being called up from the minors. Kurt Suzuki had three hits and drove in three runs, including a two-run homer in the first off Matt Harvey (0-2), who allowed six runs and eight hits in six innings. Published: April 19, 2018, 8:40 p.m. Updated: April 19, 2018, 11:05 p.m.